Have you ever thought of putting the two together? I know, I can hear your groans from here! Who would have thought that chocolate and bacon would taste so good? I would never even have thought about it but our oldest daughter at home received a Birchbox subscription (her invite link) as a gift. If you aren’t familiar with Birchbox, it is a box of sample size, high-end products, normally cosmetics, body care or fragrances, that is delivered once a month. But, with her last box, she received a maple bacon flavored mini chocolate bar from Chuao Chocolatier. WOW – was it good! That little mini chocolate bar got my wheels a-turnin’ and I thought if it is that good, think how good the real thing would be. While it was purported to be 100% natural, it was sweetened with sugar and other ingredients that could be improved upon. So I set out to make it healthier. I have to admit, Healthy Chocolate Covered Bacon was met with skepticism by my crew. For the life of me, I can’t imagine why. Maybe you agree and maybe you don’t. But I had a couple of boys say that they would rather just have bacon – GASP! My one requirement is that you not pass judgement too fast – don’t knock it till you try it! Yes, it is different. Maybe even a bit odd. But just think what a fabulous cook everyone will think you are when you serve chocolate covered bacon at your next gathering. Plus, it is not just any ol’ chocolate that covers that there bacon! It is chocolate made with coconut oil. Isn’t this a great way to get your daily dose of coconut oil? Still not sure? OK, how about this argument – Coconut Oil is Good for You! I started taking coconut oil daily to help balance hormones and give my metabolism a boost (read: I wanted to shed a few pounds – let’s keep that between us!). But, there is a lot more to coconut oil than just that. decreases cholesterol levels. Coconut oil has a saturated fat called lauric acid which has been shown to increases the good HDL cholesterol in the blood to help improve cholesterol ratio levels. If you are looking for a dependable source of coconut oil check out my affiliate partner – click here. 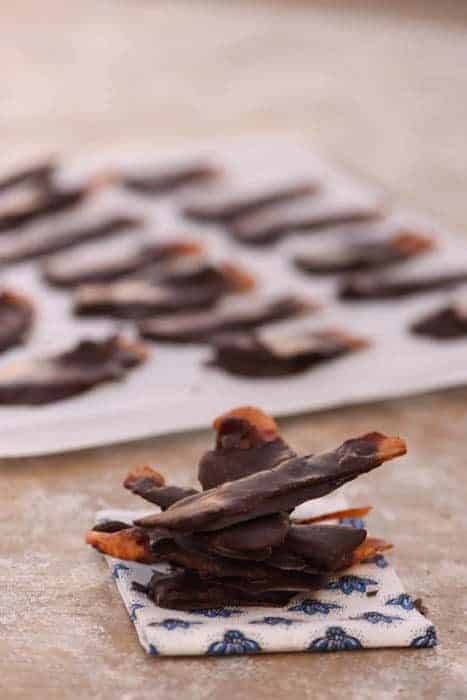 So, now that you are thoroughly convinced to give Chocolate Covered Bacon a chance, here’s the recipe! I buy all my real salt and spices from my affiliate partner Starwest Botanicals because of their superior quality. Their herbs & spices are organic, non-irradiated plus, I think they are more aromatic and full flavored than any others. Place bacon on foil lined cookie sheet and bake in preheated oven at 375 F for 15 - 20 minutes or until done - remove from oven and allow the bacon to cool. While the bacon is cooking, mix the coconut oil, vanilla, espresso and honey (or maple syrup) together. If the coconut oil is solid, melt in the microwave (or oven). Blend the remaining ingredients into coconut oil mixture - sea salt, cocoa powder. I used an immersion blender. 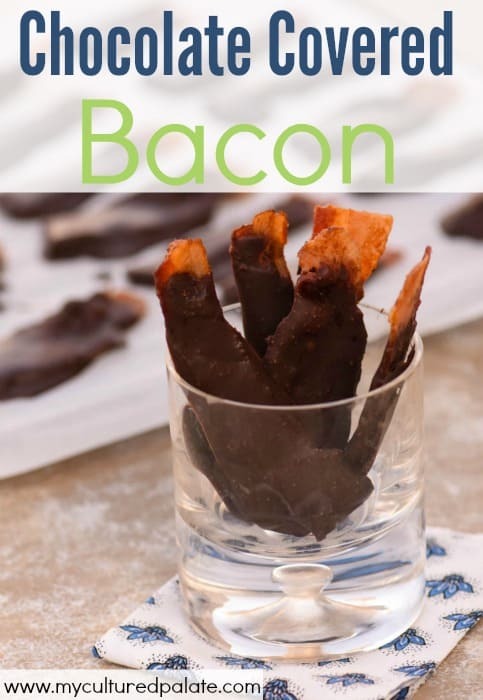 Cut each slice of bacon in half and holding one end, dip the bacon into the chocolate. Allow the chocolate to dry - I put it in the freezer for about 5 minutes. You may dip the bacon again if desired.